Synopsis- Her mother executed for witchcraft, her father dead at the hand of a noble, Victoire Charpentier vows to rise above her poor peasant roots. 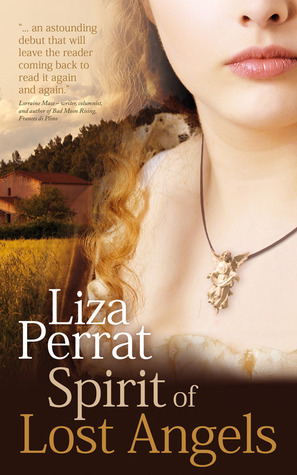 Review- Liza Perrat is an Australian author residing in France who has debuted with her historical fiction novel, Spirit of Lost Angels. Its set in the 1700’s during the French Revolution. The protagonist, Victoire Charpentie is a peasant girl from Lucie-sur-Vionne in France who has a traumatic childhood- losing both of her parents. Over the course of her life she faces many more challenges yet she is a resilient and determined young woman. As a young girl she dreamed of marrying her best friend Leon but she was sent away as a teenager to a noble family to work as a scullery maid. Here she was molested by a Marquis and falls pregnant. She has no choice but to abandon her child and reluctantly returns to Lucie-sur-Vionne to be wedded to a kind, widowed man who also happens to be Leon’s father. She must set aside her feelings for Leon and be a dutiful wife, raising young and living at least a couple of years contently. However, this stability is interrupted when her husband falls ill and during a very deep well of grief tragedy strikes and Victoire’s life is never to be the same again. The time Victoire spent in an asylum was particularly interesting, albeit disturbing. As I work in the mental health field, I am both fascinated and sickened by the methods of treatment and oppression of women utilized in earlier times. Perrat throws many obstacles in Victoire’s path of survival, but there are certainly times when Victoire is allowed to grow and rise above the adversity. She discovers a different side to her sexuality when she befriends the seductive Jean in the prison asylum and upon re-entering society Victoire takes on the persona of a lady of higher status and becomes involved in the politics that surrounded the French Revolution. Spirit of Lost Angels is an epic historical saga spanning over several decades of the protagonist’s life. It is both exhausting and moving as Victoire’s life unfolds and it was encouraging how resilient and courageous she was to overcome the hard times in her life. A fantastic historical fiction debut by an Australian author living abroad. About the author: Liza grew up in Wollongong, Australia, where she worked as a general nurse and midwife for fifteen years. Spirit of Lost Angels is the first in a historical series set against a backdrop of rural France. I really enjoyed this book…it is reviewed on my blog as well. Many thanks, Jayne, for the time and effort you have put into reviewing Spirit of Lost Angels. It is much appreciated!